TEHRAN, Iran (CNN) -- Iranian opposition leader Mir Hossein Moussavi and a fellow presidential candidate are requesting a permit to hold a commemoration ceremony for those killed in the fallout after the June 12 elections, according to a post on Moussavi's Web site Sunday. 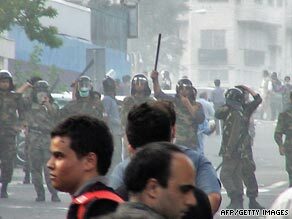 Iranian riot police block protesters on a Tehran street last month. At least 20 protesters were killed and more than 1,000 were arrested in Tehran in the first few days after the election, according to human rights groups. Moussavi, a reformist and chief rival to President Mahmoud Ahmadinejad, and fellow candidate Mehdi Karrubi sent the letter requesting a permit for the ceremony to the Islamic republic's interior minister, according to Moussavi's Ghalam News Web site. The candidates want to hold the ceremony on Thursday at the site for Friday prayers, saying the date would signify the 40th day after the chaotic street demonstrations. For Iranians, a predominantly Shiite Muslim population, the 40th day marks the last official day of mourning in the immediate aftermath of a death.